The climate is changing, and our gardening practices must follow suit. Here are a few tips for sustainable gardening in a changing climate. As our climate changes, and water shortages increase, gardeners are faced with new challenges that we haven’t had to deal with before. In some areas of the United States, the idea of a traditional English garden is no longer sustainable in any sense of the word. 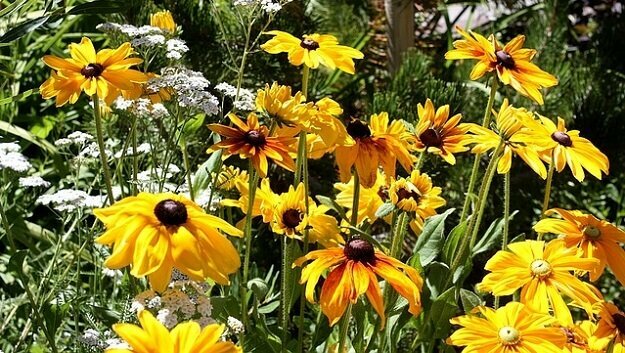 Homeowners in the West and Southwest are exploring creative ways to replace their water-hogging lawns with native plants and water-less landscaping. In other areas, rainfall has increased, followed by periods of drought, which also requires a different approach to gardening. So how do we meet these challenges in a thoughtful, sustainable way that is good for the planet? When taking your yard in a new direction, experts say, the first step is to know your site. Do you have a slope? Is it shady or sunny? Plants on the top of an incline will be drier and plants at the bottom will be wetter. But when the water dries up, the plants at the bottom need to be fine when it’s dry, too. Many arboretums, botanical gardens, native plant societies and local extension services offer brochures, online help, and classes on suitable plants and landscapes for various climates and regions. Many also maintain native plant gardens to inspire home gardeners, and some communities offer incentives to homeowners making the shift toward more sustainable yards. Rain gardens are “a great idea for any part of the country. … You take out a small area of lawn and make a depression into which you direct the rainwater coming off your roof. Instead of rainwater running down the driveway and overwhelming sewers, it goes into an area planted with occasionally heavy downpours in mind,” explained Susan Middlefield, horticulture editor for the Vermont-based National Gardening Association. Sustainable lawn varieties being used successfully in New York City include tall fescues mixed with Kentucky bluegrass, she said. “Composting yard waste and putting out a bucket for rainwater are huge in their environmental impact, and are both very easy ways to start gardening more sustainably,” Sifton added.